It’s no wonder that I, a librarian, interested in all things Dracula and Eastern Europe, would be drawn to Elizabeth Kostova’s 2005 novel The Historian. It contains almost all of my obsessions in one book. Professor Rossi, the character speaking in the above passage, describes Dracula’s library with such admiration and detail, that a librarian like myself is both jealous and excited at just reading his words. Well, I am happy to say, that during Spring Break 2015, I was able to act out this fictional scene in real life. I, standing in for Rossi, took a small road trip to home of famed vampire scholar Dr. J. Gordon Melton. 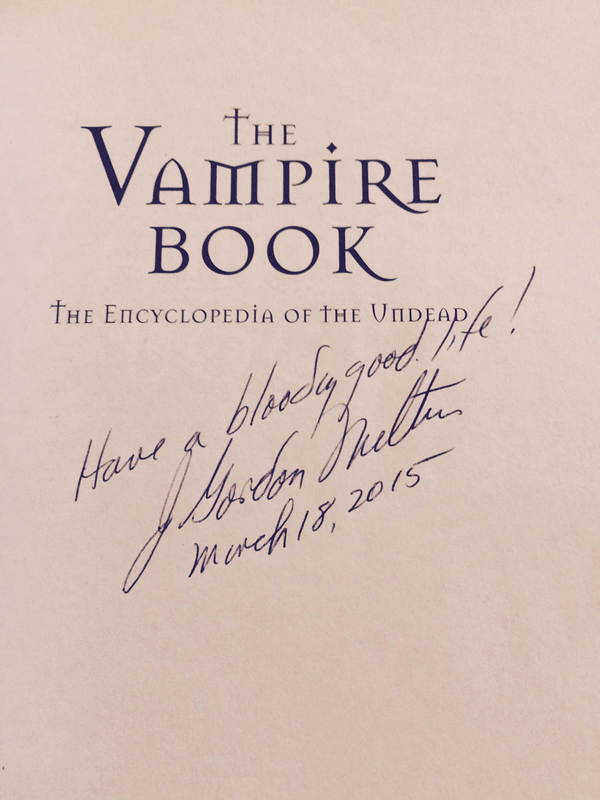 Dr. Melton is the author of The Vampire Book: The Encyclopedia of the Undead (1994; 1999; 2011), The Vampire Gallery: A Who’s Who of the Undead (1998), VideoHound’s Vampires on Video (1997), and the forthcoming bibliography The Vampire in Folklore, History, Literature, Film and Television (2015). 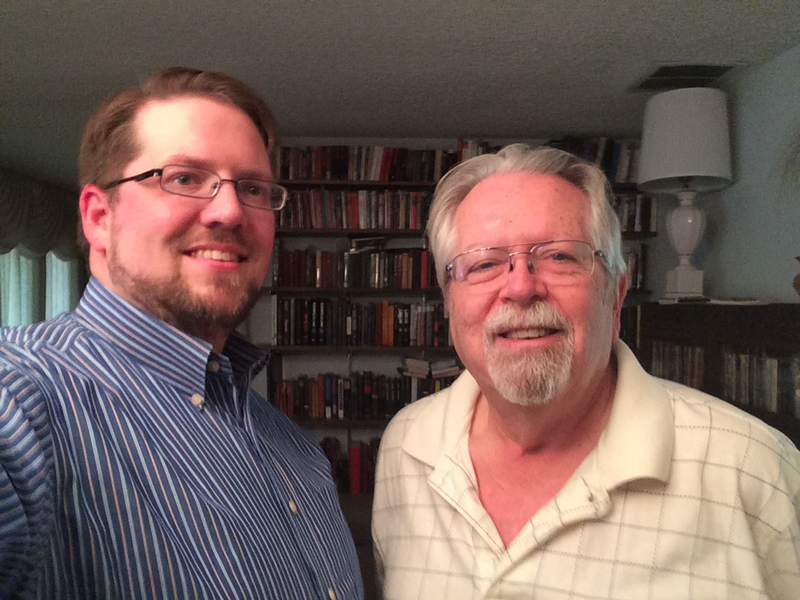 I have been wanting to connect with Dr. Melton for a few years, since he lives fairly close, and everything just seemed to work out for this to be the time. When I arrived at his house, Professor Melton led me into a room to wait a few minutes, and it was in this room where I first noticed the books. My first reaction, at seeing a few cases of books, was something along the lines of, “Wow, he has a lot books about vampires.” My friends, “a lot of books” is the understatement of the century! After we talked for a few minutes, Dr. Melton invited me to take a tour of his collection. I thought he was going to show me around this one room, which was already impressive to me. Instead, he led me into a larger living area with full-length shelves along the walls. I was now starting to feel the excitement that Rossi describes upon seeing Dracula’s library. 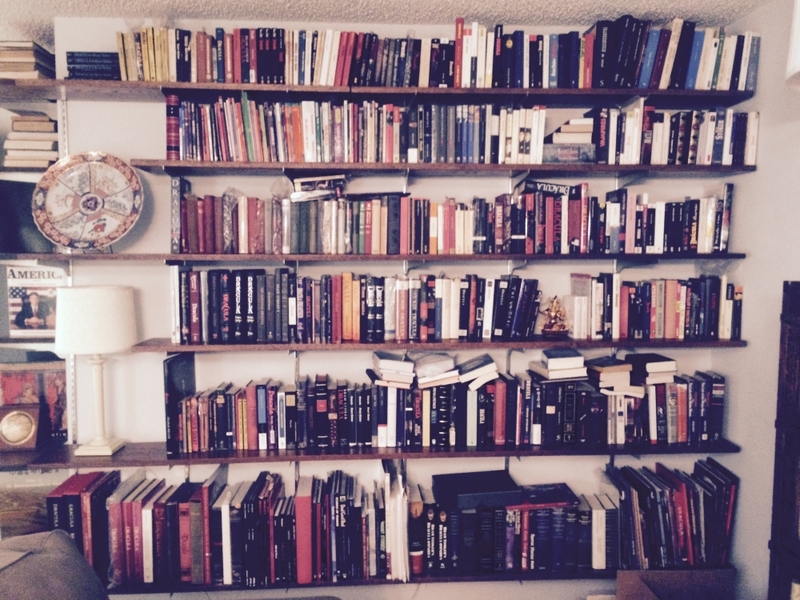 In fact, one entire wall was dedicated to different editions of Stoker’s novel. But, the tour was not over. Dr. Melton’s collection continues throughout the home. There were more books, movies, posters, comic books, and autographs. A lifetime of collecting. It is truly one of the most comprehensive and impressive personal collections in the world. Without giving too much away, I will say that the number of items is in the thousands, and is arranged by subject and/or genre. 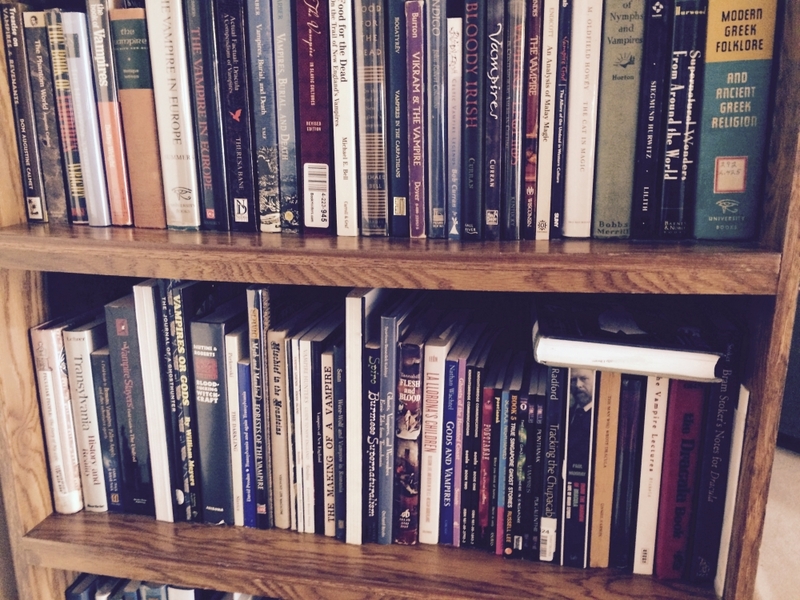 Much of the collection serves as the basis for the new bibliography. I was especially impressed with the Dracula collection, pictured above, and I was very interested in his collection of books on folklore and the vampire in general. After we had toured his collection, and sat and talked for quite a long time, I asked if he would be willing to sign my copies of The Vampire Book and The Vampire Gallery. Not only was he more than willing, but he also gave me copies of the books that I didn’t already own! And he did not stop there. He also allowed me to look through some of duplicate copies of books, and when I finally left, I had about two boxes of books for my own collection. It was a wonderful first meeting, and a precursor of many great things to come. I hope to be able to visit Dr. Melton and his wonderful collection again very soon. Interestingly enough, though, Dr. Melton is not the only vampire author in my area. 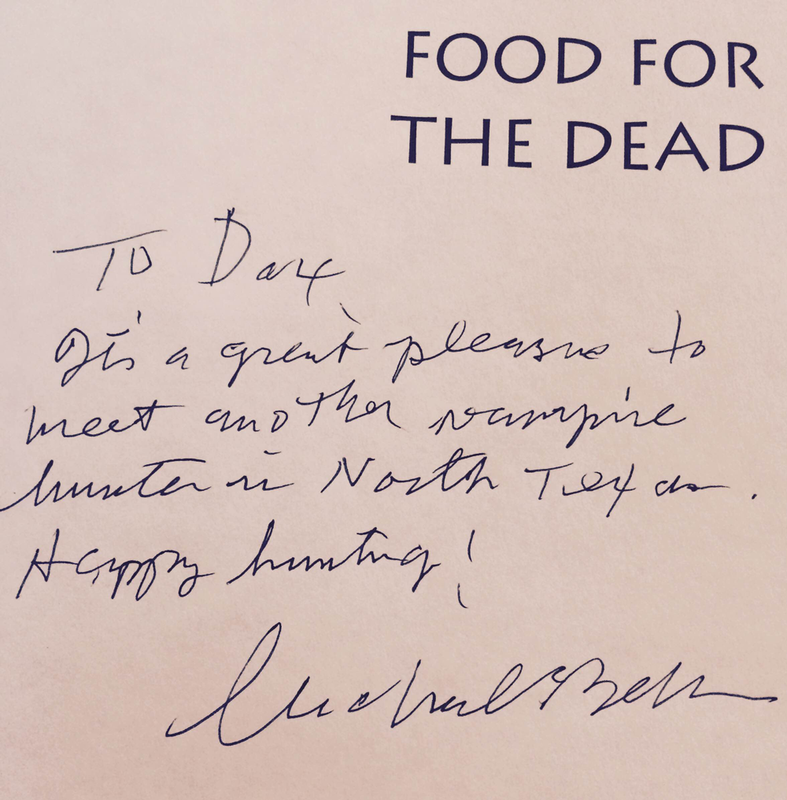 Just two days after my meeting with the professor, I found myself having coffee with folklorist Michael Bell, author of Food for the Dead: On the Trail of New England’s Vampires (2001; 2011). Dr. Bell can also be found online at Vampire’s Grasp and Food for the Dead. I have often told the story in my lectures of Mercy Brown, America’s most well-known vampire from Rhode Island. Dr. Bell was a folklorist with the Rhode Island Historical Preservation & Heritage Commission for many years, and has spent his career studying the many, many cases in what is often referred to as the New England Vampire Panic of the 1800s. His book is wonderful collection of first-hand experiences from his time spent exploring the various sites in New England where numerous exhumations of supposed “vampires” took place from the eighteenth to early twentieth centuries. 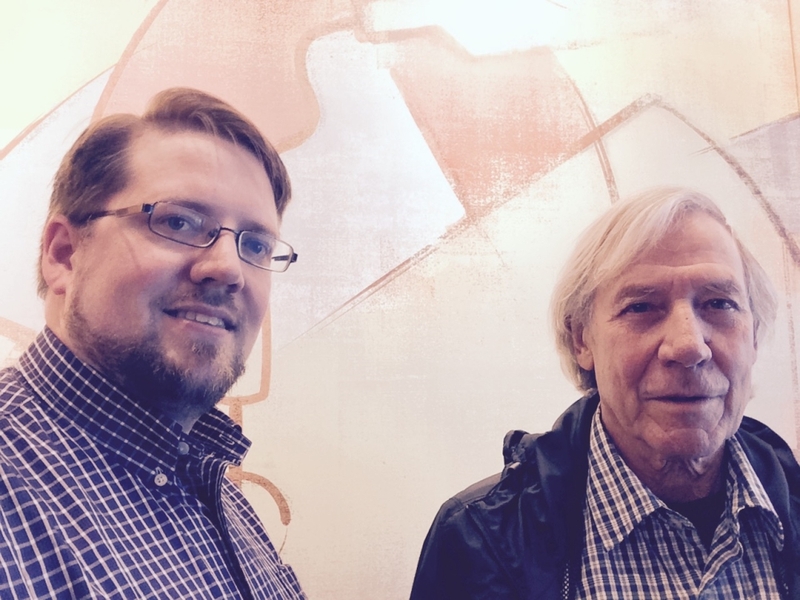 We had a very interesting conversation about his work, writing a book, and publishing. We also talked about ideas for ways to connect other vampire scholars in Texas, since there are actually quite a few. And of course, I got my copy of the book signed! I was very lucky to catch Dr. Bell when I did, since he splits his time between Rhode Island and Texas. But, as with Dr. Melton, this meeting was the beginning of great things to come. Kostova, Elizabeth. 2005. The Historian. New York: Little, Brown and Company. Dax Stokes blogs as The Vampire Historian and hosts his own podcast; his overview of Dr. Melton’s books is available in the episode titled “The Librarian Meets the Collector” (March 25, 2015). Keep updated on his posts by liking him on Facebook and following him on Twitter. I know who you are. Can you please tell us more?